After suffering through three years of eating Australian, Malaysian, and Chinese beef and pork in Singapore (there's no room for animals to roam there - some houses in Frontenac are bigger than the whole island), I had all but given up eating meat. The pork lacked flavor and the beef's taste was abysmal. I needed American beef! American pork! The good stuff. When I washed ashore in the US, I slowly began adding it back into my diet. Then I turned it up to 11. All of a sudden my freezer and fridge were full of sausages, burgers, cured meats, smoked meats, raw meats, cooked meats, dried meats! Why the sudden change? 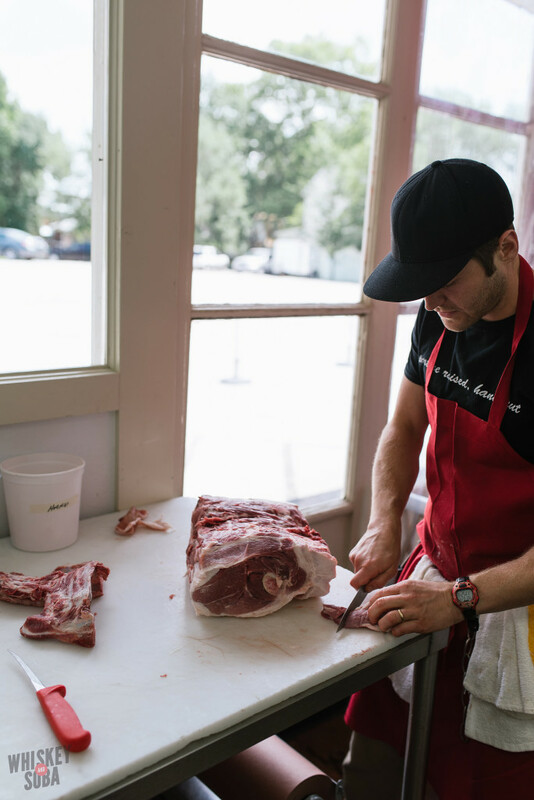 Two reasons: Truffles Butchery and Bolyard's Meat & Provisions. 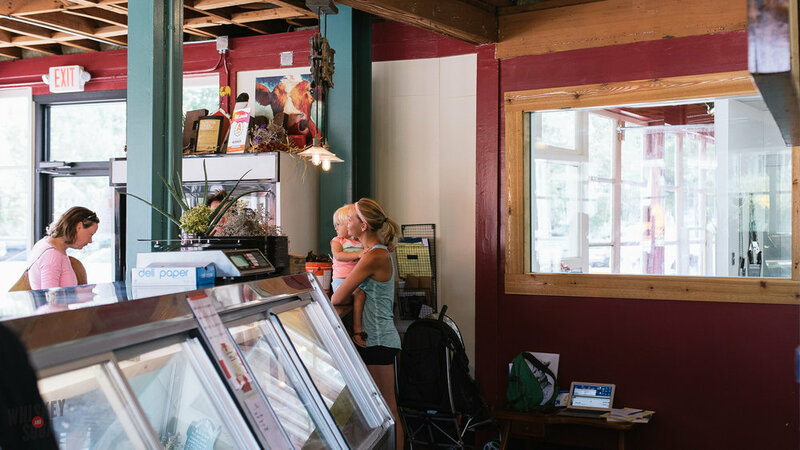 If you don't already know, Bolyard's is owned by Chris (formerly of Sidney Street Cafe) and Abbie Bolyard, though I believe the brains of the operation may actually be Betty, their adorable, chorizo munching daughter. 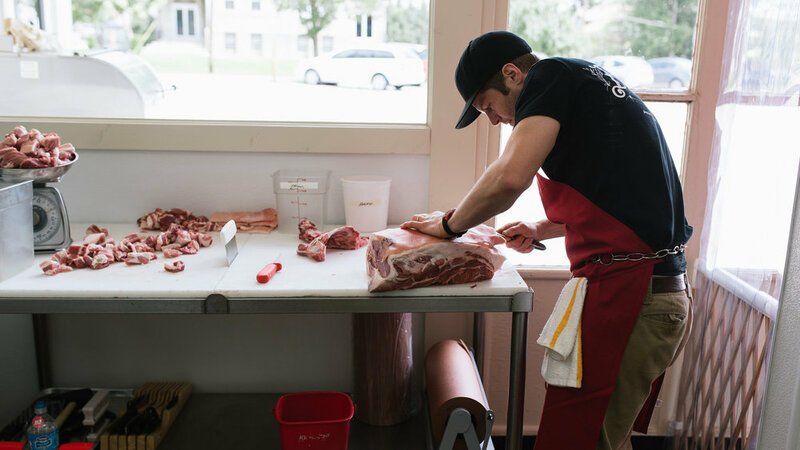 They offer lamb, pork, beef, and chicken, all sourced from small Midwestern farms. When you walk in, you'll see a big board with the cuts available, plus a display case with all their creations. The creations range from the known (hot dogs, hamburgers, meatballs), to the more unfamiliar (tasso, lamb merguez, country pate), to the OMG is that?? (beef heart pastrami, blood bologna, confit chicken hearts). Watching Chris prepare a pork shoulder for smoking was awe-inspiring. His finesse with his knives was so smooth and precise - I went home and attempted to prepare my own pork shoulder at Chris Boylard speed and now have 2 less fingers. As he finished up the shoulder, a truck pulled up with two huge freezers in the back. Chris smirked and beckoned me outside. If those guys weren't all wearing butcher's aprons and Bolyard's shirts, neighbors might get the wrong idea about what goes on inside Bolyard's. It's not every day you see a bunch of meat hook wielding gents carrying a massive plastic wrapped body. I would have offered to help them carry in the humongous cow quarters, but, you know, I was busy photographing. 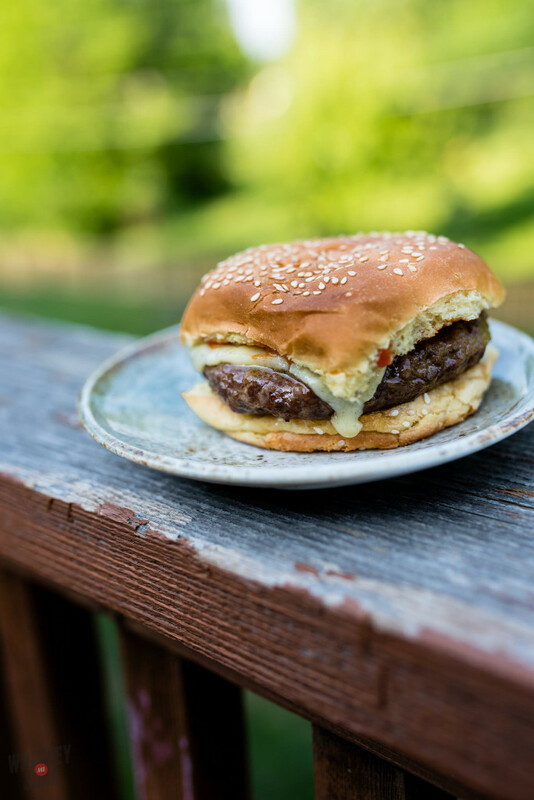 As part of the James Beard Better Burger Project, Bolyard's has been making "omnivurgers", a beef and mushroom hamburger patty that is just off the chain. I don't even really like mushrooms and I've got 12 or so of these in my freezer. Just look at that bad boy cooked and ready to be devoured. 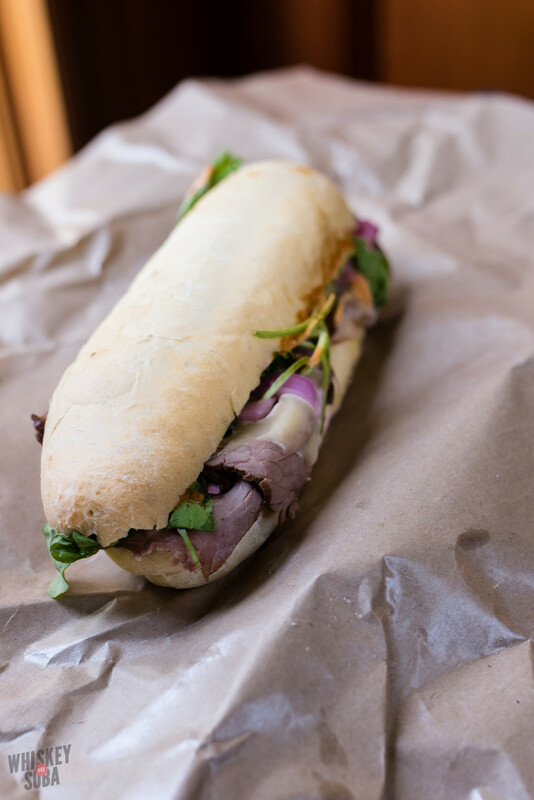 Route 66: Roast beef, porchetta di testa, arugula, pickled red onion, chipotle aioli, all on a Companion Peacemaker roll. SO F***ING GOOD. 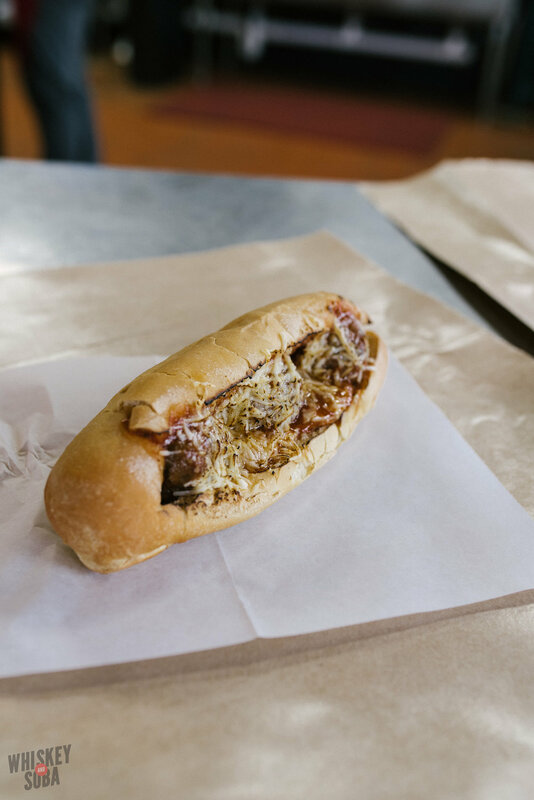 The meatball sub: housemade meatballs (get them, freeze them, break them out whenever you're feeling low), housemade sauce, shredded cheese. REALLY F***ING GOOD. 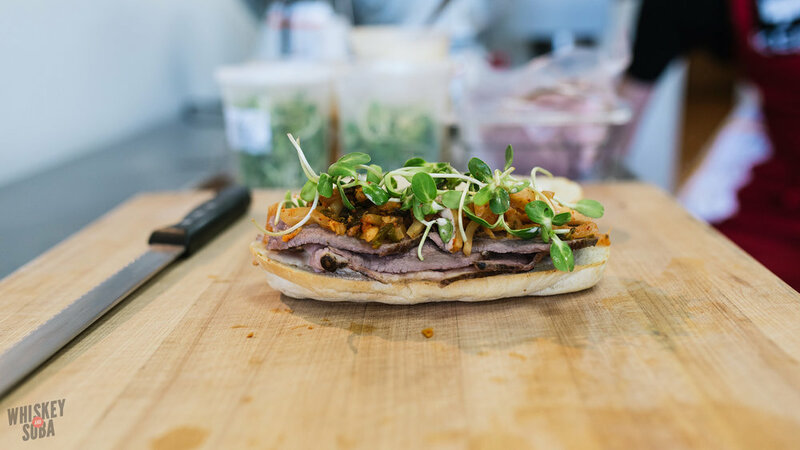 My favorite so far has been the special this week, the [symple_highlight color="blue"]Seoul Mate[/symple_highlight]: ham, roast beef, Korean barbecue aioli, kimchi, sunflower sprouts, crunchy Ramen noodles. Just let that sink in. How smart is it to smash up ramen noodles and use them as a topping? 5/5, EXTREMELY F***ING GOOD. Walking into a place like Bolyard's is, in a lot of ways, what things were like in days past, I imagine. Before the era of Schnucks, Dierbergs, and the faceless butcher. Chris and his team know what I like and what my family likes. They remember the things I ordered before. You want something custom ordered or prepared differently? Just ask. If you haven't visited Bolyard's, this week is the perfect opportunity to do so. You want to impress your friends on the 4th, right? That all starts with having great meat. You can try your luck by just showing up, or you can call and order ahead. My recommendation: Omnivurgers and Berzerkers, a beef, bacon, horseradish, and cheddar sausage. Bring a military ID and get 20% off. And, if you're reading this today (Thursday), they're doing their Thursday night smoke out. Call to inquire about what's available (I do know they're doing a rabbit porcheta stuffed with bratwurst!). Seriously. Go. This is what I've got in my fridge and freezer right now from Bolyard's: Omnivurgers, lamb merguez, berzerkers, hot dogs, bratwurst, buffalo turkey sausages, meatballs, pickled red onions, bread and butter pickles, beef tallow. I'm ready for the 4th.